Medical oncologist Jason Luke, MD, is an expert in melanoma treatment and research. Melanoma is an increasingly common and aggressive form of skin cancer that requires expert treatment. 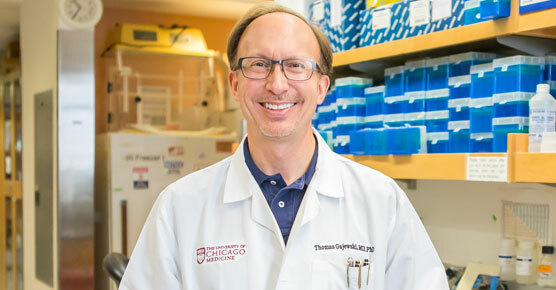 As the home to a National Cancer Institute-designated comprehensive cancer center, the University of Chicago Medicine is at the forefront of developing powerful new treatments, including immunotherapy, to treat melanoma. We take on some of the most advanced cases of melanoma and apply the latest research and innovative clinical trials to provide the best outcomes for our patients. Melanoma typically occurs when melanocytes ­­­­— the cells that make pigment — become cancerous, usually by damage from sun exposure (UV light). Because it can spread quickly through lymph nodes and to the internal organs, it is the deadliest of skin cancers. When diagnosed and treated early, however, melanoma has a high cure rate. To detect the earliest signs of melanoma, we recommend tracking changes in your moles with a painless, noninvasive tool called mole mapping. During the first session, a member of our skin care team will take up to 20 digital photos of your entire skin surface. Then the dermatologist will look for any suspicious moles that should be monitored more closely. A microscopic photograph is taken of these moles which are then "mapped" to the photos. All of the photographs are stored in a secure database so they can be reviewed for changes at your next visit — usually six to 12 months later. You will receive a copy of your photos on a CD to be used to monitor your skin between visits. If the dermatologist discovers a change in a mole, it could be an early sign of melanoma. At UChicago Medicine, our dermatologists are often able to perform a biopsy of a suspicious mole on the same day as mole mapping. Early detection is important because melanoma is very treatable in its early stages. If left untreated, melanoma often spreads to other organs or distant sites in the body, such as the liver, lungs, bones and brain and becomes known as metastatic melanoma. In order for melanoma to be diagnosed, a doctor may perform a biopsy of the suspicious lesion. The pathologist will then analyze the tissue sample to look for the presence of cancerous cells. A sentinel lymph node biopsy may also be performed, to check if the melanoma has spread. With the results of the biopsy, including the stage of the cancer, doctors make a diagnosis and develop a personalized treatment plan. 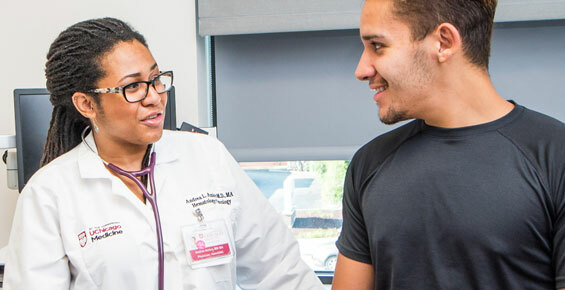 At UChicago Medicine, an experienced team of pathologists, dermatologists, medical oncologists, surgeons and radiation oncologists work together to come up with a personalized treatment plan for each patient. Treatment for melanoma depends on the stage of the disease and whether it has spread beyond the original tumor. Early stage, localized melanomas (typically stages 0, IA, IB, IIA) are often cured with surgery alone to remove the tumor and some surrounding tissue. Melanomas that involve the lymph nodes may require treatment in addition to surgery. Stage III melanomas can be very complicated to treat and could require more aggressive surgery and potential removal of lymph nodes as well as adjuvant therapies, such as radiation therapy or targeted therapies (those that target the tumor's specific genetic alterations). Treatment options for metastatic melanoma have expanded rapidly over the past several years because of advances in understanding of melanoma biology and of using the immune system to fight cancer (immunotherapy). Eight new drugs have been approved by the FDA to treat melanoma since 2011, and many drug combinations are now showing promising results in clinical trials. These promising and potent drugs, which work by harnessing the body’s immune system and direct it to attack tumors, are quickly becoming the new standard of care and provide remarkable benefits to patients with melanoma. UChicago Medicine researchers were among the country’s first to test these therapies in clinical trials and are on the forefront of discovery in finding new ways to harness the immune system to fight cancer. Our doctors are currently studying a number of new treatments for melanoma. These include novel melanoma vaccines, gene therapy approaches, new drugs that act on specific molecular targets and combining immunotherapy drugs with each other and with other drugs. 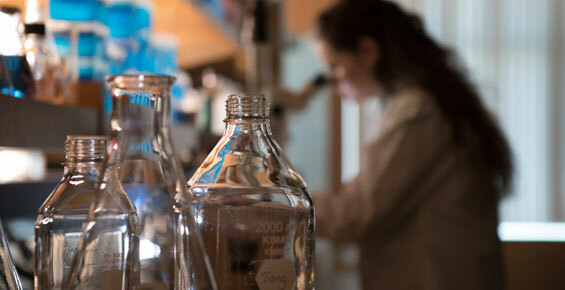 With dozens of clinical trials available for melanoma, including many early-phase trials, we are leading the search for more effective therapies that improve the quality of life for our patients. Cancer treatment hasn't slowed architect Anwar Hakim down. And he wants to keep it that way. Hakim's melanoma was treated with a combination immunotherapy based on UChicago Medicine research. The treatment worked quickly and side effects were minimal, allowing Hakim to maintain a full work and travel schedule while receiving the therapy. Find a melanoma clinical trial.